Zanzibar is a semi-autonomous region of Tanzania. It is composed of the Zanzibar Archipelago in the Indian Ocean, 25–50 kilometres (16–31 mi) off the coast of the mainland, and consists of many small islands and two large ones: Unquja (the main island, referred to informally as Zanzibar) and Pemba Island. The capital is Zanzibar City, located on the island of Unguja. Its historic centre is Stone Town, which is a World Heritage Site. Zanzibar's main industries are spices, raffia, and tourism. In particular, the islands produce cloves, nutmeg, cinnamon, and black pepper. For this reason, the Zanzibar Archipelago, together with Tanzania's Mafia Island, are sometimes called the "Spice Islands" (a term also associated with the Maluku Islands of Indonesia). A Greco-Roman text between the 1st and 3rd centuries, the Periplus of the Erythraean Sea, mentioned the island of Menuthias, which is probably Unguia. Zanzibar, like the nearby coast, was settled by Bantu-speakers at the outset of the first millennium. Archaeological finds at Fukuchani, on the north-west coast of Zanzibar, indicate a settled agricultural and fishing community from the 6th century CE at the latest. The considerable amount of daub found indicates timber buildings, and shell beads, bead grinders, and iron slag have been found at the site. There is evidence for limited engagement in long-distance trade: a small amount of imported pottery has been found, less than 1% of total pottery finds, mostly from the Gulf and dated to the 5th to 8th century. The similarity to contemporary sites such as Mkokotoni and Dar es Salaam indicate a unified group of communities that developed into the first center of coastal maritime culture. The coastal towns appear to have been engaged in Indian Ocean and inland African trade at this early period.Trade rapidly increased in importance and quantity beginning in the mid-8th century and by the close of the 10th century Zanzibar was one of the central Swahili trading towns. Persian, Indian, and Arab traders used Zanzibar as a base for voyages between the Middle East, India, and Africa. Unguja, the larger island, offered a protected and defensible harbor, so although the archipelago offered few products of value, traders settled at Zanzibar City ("Stone Town"), a convenient point from which to trade with the other Swahili coast towns. Vasco da Gama's visit in 1498 marked the beginning of European influence. In 1503 or 1504, Zanzibar became part of the Portuguese Empire when Captain Ruy Lourenço Ravasco Marques landed and demanded and received tribute from the sultan in exchange for peace. Zanzibar remained a possession of Portugal for almost two centuries. It initially became part of the Portuguese province of Arabia and Ethiopia and was administered by a governor general. Around 1571, Zanzibar became part of the western division of the Portuguese empire and was administered from Mozambique. It appears, however, that the Portuguese did not closely administer Zanzibar. The first English ship to visit Unguja, the Edward Bonaventure in 1591, found that there was no Portuguese fort or garrison. The extent of their occupation was a trade depot where produce was purchased and collected for shipment to Mozambique. "In other respects, the affairs of the island were managed by the local 'king', the predecessor of the Mwinyi Mkuu of Dunga." This hands-off approach ended when Portugal established a fort on Pemba Island around 1635 in response to the Sultan of Mombasa's slaughter of Portuguese residents several years earlier. Portugal had long considered Pemba to be a troublesome launching point for rebellions in Mombasa against Portuguese rule. The precise origins of the sultans of Unguja are uncertain. However, their capital at Unguja Ukuu is believed to have been an extensive town. Possibly constructed by locals, it was composed mainly of perishable materials. The Harem and Tower Harbour of Zanzibar. The Portuguese arrived in East Africa in 1498, where they found a series of independent towns on the coast, with Muslim Arabic-speaking elites. While the Portuguese travelers describe them as 'black' they made a clear distinction between the Muslim and non-Muslim populations. Their relations with these leaders were mostly hostile, but during the sixteenth century they firmly established their power, and ruled with the aid of tributary sultans. The Portuguese presence was relatively limited, leaving administration in the hands of preexisting local leaders and power structures. This system lasted till 1631, when the Sultan of Mombasa massacred the Portuguese inhabitants. For the remainder of their rule, the Portuguese appointed European governors. The strangling of trade and diminished local power led the Swahili elites in Mombasa and Zanzibar to invite Omani aristocrats to assist them in driving the Europeans out. In 1698, Zanzibar came under the influence of the Sultanate of Oman. There was a brief revolt against Omani rule in 1784. Local elites invited Omani merchant princes to settle on Zanzibar in the first half of the nineteenth century, preferring them to the Portuguese. Many locals today continue to emphasize that indigenous Zanzibaris had invited Seyyid Said, the first Busaidi sultan, to their island, claiming a patron-client relationship with powerful families was a strategy used by many Swahili coast towns since at least the fifteenth century. 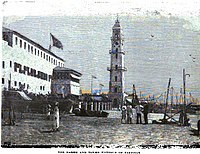 In 1832, or 1840 (the date varies among sources), Said bin Sultan, Sultan of Muscat and Oman moved his capital from Muscat, Oman to Stone Town. After Said's death in June 1856, two of his sons, Thuwaini bin Said and Majid bin Said, struggled over the succession. Said's will divided his dominions into two separate principalities, with Thuwaini to become the Sultan of Oman and Majid to become the first Sultan of Zanzibar, the brothers quarreled about the will, which was eventually upheld by Charles Canning, 1st Earl Canning, Great Britain's Viceroy and Governor-General of India. Until around 1890, the sultans of Zanzibar controlled a substantial portion of the Swahili coast known as Zanj, which included Mombasa and Dar es Salaam. Beginning in 1886, Great Britain and Germany plotted to obtain parts of the Zanzibar sultanate for their own empires. In October 1886, a British-German border commission established the Zanj as a 10-nautical-mile-wide (19 km) strip along most of the African Great Lakes region's coast, an area stretching from Cape Delgado (now in Mozambique) to Kipini (now in Kenya), including Mombasa and Dar es Salaam. Over the next few years, however, almost all of these mainland possessions were lost to European imperial powers. The sultans developed an economy of trade and cash crops in the Zanzibar Archipelago with a ruling Arab elite. Ivory was a major trade good. The archipelago, also known as Spice Islands, was famous worldwide for its cloves and other spices, and plantations were developed to grow them. The archipelago's commerce gradually fell into the hands of traders from the Indian subcontinent, whom Said bin Sultan encouraged to settle on the islands. During his 14-year reign as sultan, Majid bin Said consolidated his power around the Arab slave trade. Malindi in Zanzibar City was the Swahili Coast's main port for the slave trade with the Middle East. In the mid-19th century, as many as 50,000 slaves passed annually through the port. 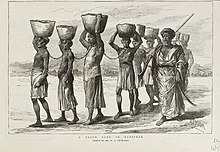 Many were captives of Tippu Tib, a notorious Arab slave trader and ivory merchant. Tib led huge expeditions, some 4,000 strong, into the African interior, where chiefs sold him their villagers for next to nothing. These Tib used to caravan ivory back to Zanzibar, then sold them in the slave market for large profits. In time Tib became one of the wealthiest men in Zanzibar, the owner of multiple plantations and 10,000 slaves. One of Majid's brothers, Barghash bin Said, succeeded him and was forced to abolish the slave trade in the Zanzibar Archipelago by the British. He largely developed Unguja's infrastructure. Another brother of Majid, Khalifa bin Said, was the third sultan of Zanzibar and furthered the relationship with the British which led to the archipelago's progress toward abolishing slavery. Monument to the slaves in Zanzibar. 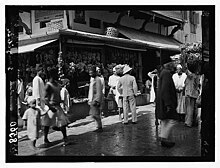 A street scene in Zanzibar during the early 20th century. In 1890 Zanzibar became a protectorate (not a colony) of Britain. This status meant it continued to be under the sovereignty of the Sultan of Zanzibar. Prime minister Salisbury explained his position: "The condition of a protected dependency is more acceptable to the half civilised races, and more suitable for them than direct dominion. It is cheaper, simpler, less wounding to their self-esteem, gives them more career as public officials, and spares of unnecessary contact with white men". From 1890 to 1913, traditional viziers were in charge; they were supervised by advisors appointed by the Colonial Office. However, in 1913 a switch was made to a system of direct rule through residents (effectively governors) from 1913. The death of the pro-British Sultan Hamad bin Thuwaini on 25 August 1896 and the succession of Sultan Khalid bin Barghas, whom the British did not approve of, led to the Anglo-Zanzibar War. On the morning of 27 August 1896, ships of the Royal Navy destroyed the Beit al Hukum Palace. A cease fire was declared 38 minutes later, and to this day the bombardment stands as the shortest war in history. The plot is 5,2 Acre (2.1 hectare) with more than 550 coconut palms and three coral stone build bungalows of approx 120 sq metres each. The bungalows will probably have to be taken down. Lots of trees and beautiful vegetation. Own access road from main road. A well with clean fresh water. Electricity connection to main grid possible. No neighbors at either side. (One plot up for sale, though). It comes with all government permits for commercial use (e.g. hotel, restaurants etc.) and will be sold as Tibu Beach Bungalows Ltd. There's the possibility to extend the plot behind. The price of the extension has to be negotiated.